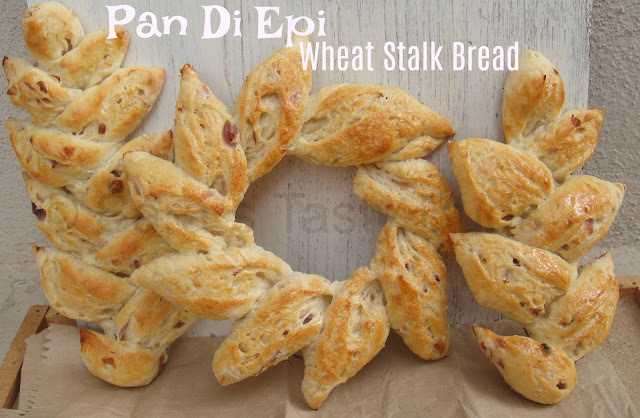 For this month’s Bread Bakers the theme choosen by was Baking with Nuts or Nut flour……. I thought of using Peanut in my bread. 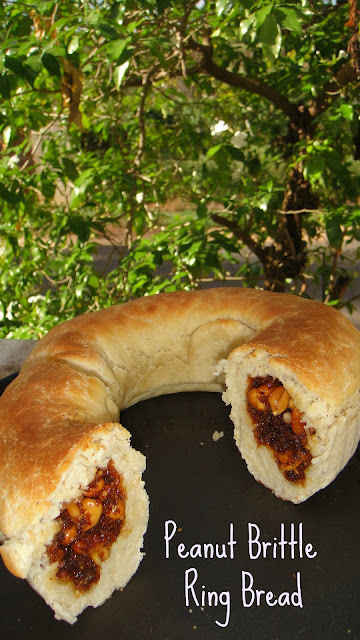 I made this Sweet brittle with peanut and coconut , stuffed this in the ring shaped bread and baked this sweet bread. In a bowl , mix together flour , salt , sugar and yeast . To this add the lukewarm water and mix the dough. Knead the dough for 15 minutes or till the dough becomes soft and smooth. Add the butter and knead again. 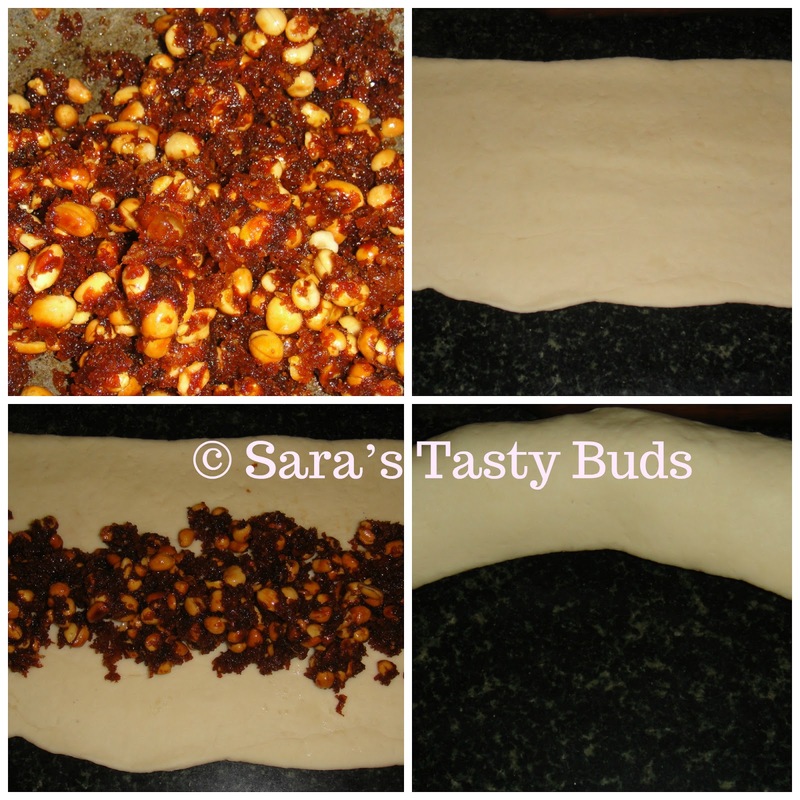 Place the dough in a oiled bowl and let it double for two hour. In a pan , add the peanuts and roast till the nice flavor comes. Let it cool and de-skin the peanuts. Add the de- skinned peanuts and sugar , heat in a slow flame . The sugar melts and starts to caramelize , mix well. Add in the brown sugar and let it melt and coats well with the peanuts. Now , add the freshly grated coconut and give a quick stir followed by clarified butter . Take off flame and let it cool. Take the doubled dough and knead once. Roll the whole dough in an elongated way , to fit the ring mould pan . 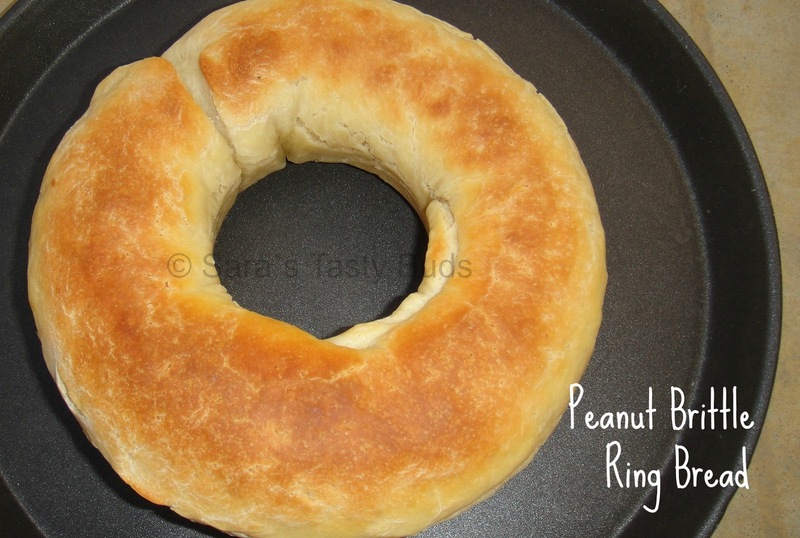 Place the cooled peanut brittle on one half of the elongated dough and roll in to a cylinder. Place this shaped bread in the ring mould pan. Bake the bread in a preheated oven @ 200* C for 40 minutes. Let the bread cool in the rack. Peanut brittle bread is ready to serve. We can make this peanut brittle without coconut too. I added coconut to avoid the brittle becomes hard. If fresh grated coconut is not available , can use dessicated coconut. Sounds like a great mix of flavors! I would try it with the coconut! 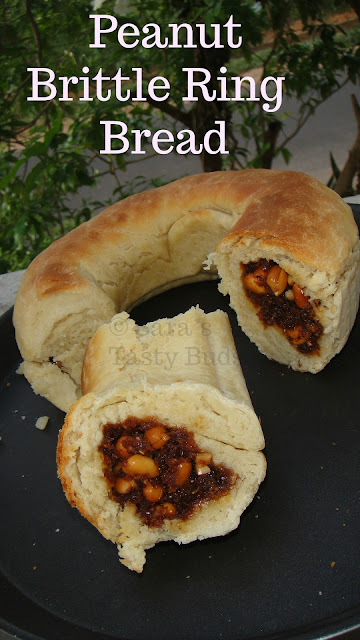 OMG that is such an unique and amazing bread Saranya. Love that peanut brittle you used as the filling. I can imagine how delicious this bread must have been. Oh my gosh that looks so good! What a clever and unique bread! That filling. I love it, Sharanya! It looks so rich. Oh my goodness.....Look at that dreamy filling....I am sold!! Hello Sharanya, the bread is unique, beautiful and has a lovely filling. Great idea! A good surprise in the bread Sharanya. Lovely bread. 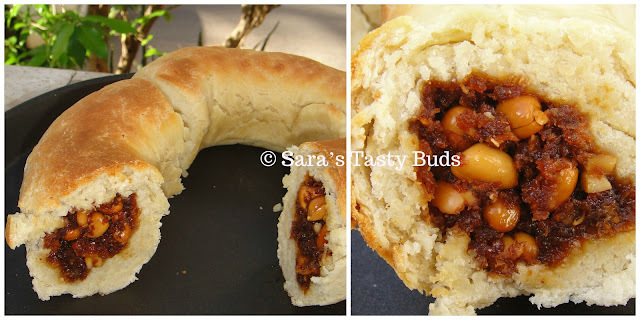 such a lovely idea of a stuffed nut bread :-)) absolutely delicious and wonderfully baked bread Sharanya !